Twenty-one American troops have been killed in Afghanistan since Friday in one of the bloodiest periods of the summer. A series of bomb attacks have badly hit US troops in eastern and southern Afghanistan in the past 48 hours. The death toll among in the Nato-led coalition has reached 484 this year and is predicted to far surpass 2009’s total of 521. Deaths have risen consistently each year since 2001. Afghan police and civilians have suffered far higher casualties. The coalition blames the rise in troop deaths partly on the influx of reinforcements, which is allowing commanders to target previously untouched insurgent safe havens where rebels are mounting stiff resistance. Gen David Petraeus, senior US and Nato commander in the country, warned last week fighting would “get harder before it gets easier”. In two of the most deadly recent incidents, three Americans died in eastern Afghanistan on one bomb attack on Tuesday. Five died in a single bomb attack in the south on Monday. Military spokesmen would not say if the bombs hit vehicles or foot patrols. Homemade bombs using old shells or homemade explosives and hidden in roads, tracks, walls, streams and buildings have become the Taliban’s favoured weapon. Their use has sparked an arms race with foreign troops evolving tactics, or relying on more heavily armed vehicles and mine detectors to try and avoid them. Who Is Behind The Tea Party Movement? The myth of the tea party being a grassroots movement takes another hit, as the New Yorker‘s Jane Mayer looks a the Koch brothers, Charles and David, who fund much of the tea party movement (via Glynnis MacNichol). The Kochs operate oil refineries in Alaska, Texas, and Minnesota, and control some four thousand miles of pipeline. Koch Industries owns Brawny paper towels, Dixie cups, Georgia-Pacific lumber, Stainmaster carpet, and Lycra, among other products. Forbes ranks it as the second-largest private company in the country, after Cargill, and its consistent profitability has made David and Charles Koch—who, years ago, bought out two other brothers—among the richest men in America. Their combined fortune of thirty-five billion dollars is exceeded only by those of Bill Gates and Warren Buffett. Mayer’s article discusses some ugly family roots. Father Fred did business with Stalin, but later came to regret it, and became one of the original members of the John Birch Society. Mayer’s piece discusses the links between Fred’s views and those of his sons. Buried deep in the article is an example of how money trumps everything. David Koch, a prostate cancer survivor, has given generously to cancer research. Koch Industries founded Americans for Prosperity, formed as a successor to Citizens for a Sound Economy. Fred Koch co-founded the John Birch Society. In the mid-1970s the Kochs started to fund a network of libertarian organizations including the United States Libertarian Party, for which David ran as the vice presidential nominee in 1980. The Kochs withdrew their financial support of the Libertarian Party after an acrimonious 1983 convention, but continue to support libertarian institutions independent of the party such as the Cato Institute, and more recently have been major contributers to the Tea Party movement. 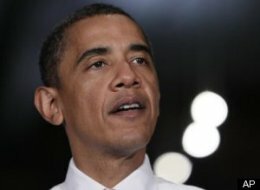 A poll released earlier this month by the nonpartisan Pew Research Center showed that 18 percent of people believe Obama is Muslim. That was up from 11 percent who said so in March 2009. Just 34 percent said Obama is Christian, down from 48 percent who said so last year. Speaking on “Fox News Sunday” with Chris Wallace, Glenn Beck gave his first interview after Saturday’s Restoring Honor rally in Washington, DC. While much of the conversation focused on the rally and religion, there were some answers that are bound to drive more water-cooler conversation on Monday. Toward the end of a lengthy response, Beck said that he “miscast” Obama’s liberation theology as racism. Then things got more interesting. Vote on a selection of Becks’ comments and watch the full 25-minute interview below. BAGHDAD — Vice President Joe Biden returned to Iraq Monday to mark this week’s formal end to U.S. combat operations and push the country’s leaders to end a six-month postelection stalemate blocking formation of a new government. Wednesday’s ceremony will signal a shift toward a greater U.S. diplomatic role as the military mission dwindles seven years after the American invasion that toppled Saddam Hussein. Underscoring the shift, officials said Biden will make a new appeal to Iraqi leaders, including Prime Minister Nouri al-Maliki, to end the political deadlock and seat a new government. March 7 parliamentary elections left Iraq without a clear winner, and insurgents have exploited the uncertainty to hammer Iraqi security forces in near-daily attacks. 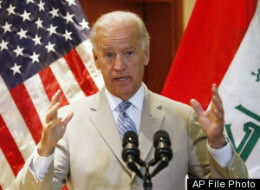 Biden and al-Maliki will meet Tuesday morning “to discuss the political situation and withdrawal, and Iraqis taking over responsibility for security,” the prime minister’s adviser, Yasin Majeed, told The Associated Press. It was the vice president’s sixth trip to Iraq since he was elected and, officially, he came to preside over a military change-of-command ceremony. On Wednesday, Gen. Ray Odierno ends more than five years in Iraq and hands over the reins as commander of U.S. forces here to Lt. Gen. Lloyd Austin. Austin also has served extensively in Iraq, most recently as commander of troop operations in 2008-09. But the Sept. 1 ceremony also marks the start of the so-called “Operation New Dawn” – symbolizing the beginning of the end of the American military’s mission in Iraq since invading in March 2003. Just under 50,000 U.S. troops remain in Iraq – down from a peak of nearly 170,000 at the height of the 2007 military surge that is credited with turning the tide in Iraq as it teetered on the brink of civil war. Additionally, U.S. troops no longer will be allowed to go on combat missions unless requested and accompanied by Iraqi forces. At his “Restoring Honor” rally, rodeo clown-turned-televangelist Glenn Beck told his flock, “America today begins to turn back to God. For too long, this country has wandered in darkness.” Beck “sounded like Billy Graham,” according to Rev. Richard Land, a prominent Southern Baptist leader. “You see, it’s all about victims and victimhood; oppressors and the oppressed; reparations, not repentance; collectivism, not individual salvation. I don’t know what that is, other than it’s not Muslim, it’s not Christian. It’s a perversion of the gospel of Jesus Christ as most Christians know it,” Beck said. Glenn Beck promotes a false gospel. However, many of his political ideas can help America. … Mormonism is not a Christian denomination but a cult of Christianity. … Many endorse false gospels including Mormonism. As ThinkProgress previously noted, “Glenn Beck often speaks about faith on his radio show and Fox News program, but he almost never mentions his own faith — Mormonism.” Bill Keller, the leader of the world’s largest interactive Christian website, said earlier this year, Beck “lies to people” by trying to portray himself as a Christian. “The fact is, the beliefs of the satanic Mormon cult are totally inconsistent with Biblical Christianity,” Keller said. It’s politically convenient for Beck to be attacking Obama’s religion, while rarely ever mentioning his own. 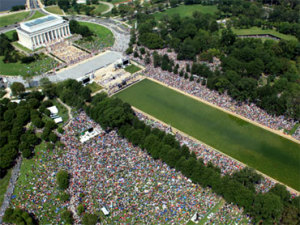 Experts hired by CBS say that Glenn Beck’s rally this weekend drew 87,000 people, plus or minus 9,000. Glenn Beck, meanwhile, says the real total is somewhere between 300,000 and 600,000. 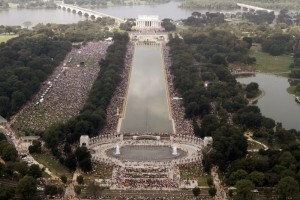 And not to be outdone, Michele Bachmann claims more than one million attended. So who is right? Well, it’s an inexact science, but let’s take a look at numbers and make our best guess based on the available evidence. 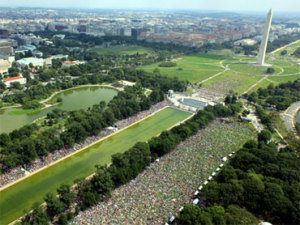 From these photos we can see that virtually all of the crowd was situated along either side of the Lincoln Memorial Reflecting Pool. There was a light smattering of people around the World War II Memorial at on the Washington Monument side of the pool and another collection of people just north of the stage off the western end of the pool.